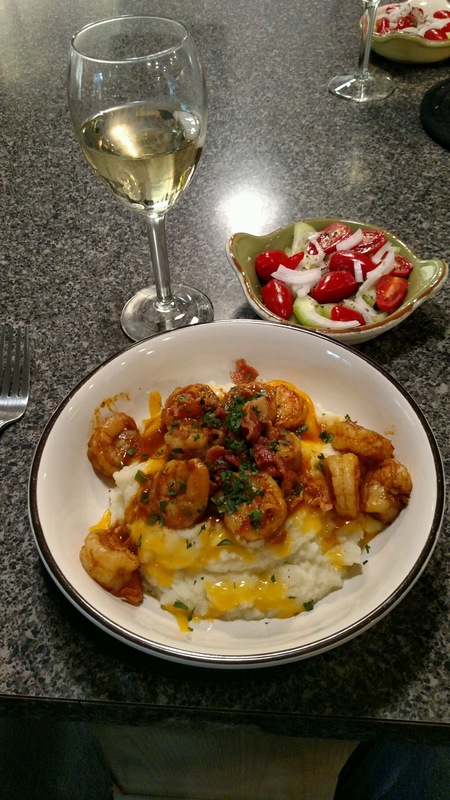 I love Shrimp, and I love Shrimp and Grits. If you are doing the Keto diet, this is very adaptable. If you are a Weight Watchers kind of person, this works too. Easy replacements are listed for both. Joe brought home some Shrimp. It’s one of those dishes whether you are watching your weight or not, it’s just good. They are, in fact, an excellent choice when you are watching the calories. Steamed and grilled are excellent choices since you aren’t adding extra fat. They have also been touted as being one of those foods that boost your metabolism, and have antixoidants, as well as anti-inflammatory properties. Spicy foods are also a metabolism booster. Winner, winner, shrimp dinner! Something else I love is mashed, or pureed cauliflower. It’s a great vehicle for many flavors. It can be mashed, broiled, pureed, or baked. I use it all he time in place of potatoes to reduce calories and carbs. I have actually become very adept in making it taste like mashed potatoes. So much so, that when I served it to someone he said, “These are the best mashed potatoes I have ever had. What did you do to them?” I had to laugh, but was, at the same time flattered he didn’t know what they were. By the way, he didn’t believe me when I told him it was cauliflower. Don’t get me wrong, I love potatoes and I cook them all the time. When I want a huge portion however, cauliflower mash does it for me every time. Try the cauliflower on it’s own and add flavors that you like. I find adding some turnip to the mix gives it that earthy flavor like potato but no added carbs. When I make cauliflower as a side dish, I also grate a bit of fresh nutmeg in it. It gives it a nice hint of warmth. Be careful, nutmeg can be overpowering if you use too much. Last, but not least, when making cauliflower mash; steam it. It absorbs a lot of water when boiled, and will make your mash runny. I promise it is big on flavor and very filling. If any of you use the point system from Weight Watchers it is only 7 Smart Points and makes two huge portions. As they say in the south “boo coo, boo coo”. Assemble and prepare all the ingredients first. For the cauliflower mash: place the cauliflower, turnip, smashed garlic, and 1/4 C chicken broth in a container covered with plastic wrap or a steamer and microwave at high for 4 minutes, stir and cook an additional 4 minutes. Transfer all to a blender or food processor with a slotted spoon, along with the granulated chicken boullion, Brummel & Brown and Laughing Cow cheese. Process until smooth or to desired consistency. Taste and season with salt and pepper to taste. Divide into 2 bowls and place in a warm oven. For the Shrimp: Coat the shrimp liberally with Cajun seasoning, toss to coat evenly. Heat a medium skillet over medium high heat and spray with cooking spray and add 1/2 Tbsp Brummel and Brown until melted. Cook the sausage, breaking it up as it cooks for about 5 minutes, then add the shrimp and cook on each side for about 1 minute or until pink, about 1-2 minutes. Reduce the heat to medium; add the tomato paste, garlic, and scallions to the shrimp and sausage mixture, stirring all together and continue to cook until the garlic is fragrant and the scallions are softened, about 1 minute. Add the white wine and the chicken broth and bring to the boil and cook for about 2 minutes or until sauce is developed. Divide the servings in half and put over top of the hot bowls of cauliflower grits and garnish with crumbled bacon, 1 slice each bowl, and parsley if using. Next Post SUNSHINE CAKE & MY DOMAIN….